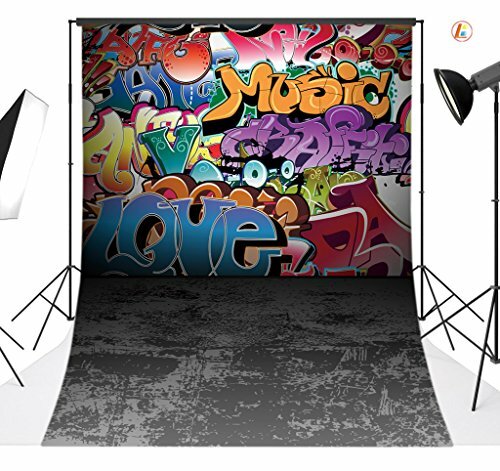 LB 5x7ft Graffiti Style Vinyl Photography Backdrop Customized Photo Background Studio Prop TY111 by LB at Marco Marcucci. MPN: TY111. Hurry! Limited time offer. Offer valid only while supplies last. Material:Thin Vinyl (not washable). Features: Light absorbant Non-reflective,Seamless.No pocket. Type: Computer-printed for realism. Material:Thin Vinyl (not washable). Features: Light absorbant Non-reflective,Seamless.No pocket. Type: Computer-printed for realism. For: different sizes for wedding, audlt, children, holiday party etc. Vinyl cloth backdrops is our latest and greatest computer painted wrinkle-free fleece-like fabric. This lightweight fabric will give you the intense vivid color that you have been looking for in a backdrop. 2. 1.5meter width x2.1meter lenght(5x7ft),weight about 360g. 3. All backdrop will send by folded,because according to rule of post office, length of item cannot be more than 1.2m. So we have to send items by folded.Below is the ways to removed the creases. 4. We can customized any size for you(5x10ft,6x9ft,8x8ft,10x10ft,10x20ft),also we can print your own picture as backdrop;Double-face vinyl backdrop is available for selling; Pls contact with us if you needs. 5. The backdrop is absorb light(not reflective,it will be different when taking pictures with photos). 6. The backdrops not high definition,will some blurred,so need distance to take pictures. 7.All vinyl backgrounds are made in China and are printed at the time of order. Handle time is 2 days. 8.Item will send by USPS(except for multi order).In usual,it will take about 7-15 days for you to get it. Material：Thin Vinyl, no pocket ,seamless, computer-printed for realism. Size:5x7ft / (1.5x2.1m), Printed on chemical fiber material for light weight and easy handling, excellent color treatment and realistic detail. Ideal for studio, club, event or home photography, a beautiful, versatile backdrop, a work of art,80's 90's theme birthday party,hip hop party backdrop. It can fold, easy to carry, swab with water, easy to keep clean; high resolution, strong articulation; vinyl backdrops are waterproof, glare free and roll out flat.